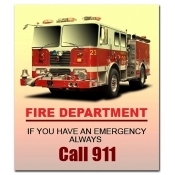 Custom fire department magnets are perfect for fire services trying to familiarize their services and improve their accessibility. These promotional magnets are built on a high- quality magnetic stock material and they lend great visibility to information imprinted against them. We offer free full-color printing which allows emergency services to go lavish with choice of colors. Avail the free ground UPS shipping anywhere within the contiguous USA. 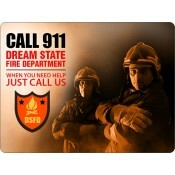 Save on wholesale orders of these promotional emergency services magnets. There is never going to be a dull day for fire services because of the increasing instances of accidental fires, bomb blasts and terrorist attacks, fire services are recalled often. However, the service scope of fire services is more than just extinguishing fire and rescuing people from the accident site. Today, they are trained to perform responsibilities such as ensuring health and wellness of their citizens, preventing injuries and more. Quick and timely response is the traits which has helped fire services to survive all these years. They can fulfill their duties with an earnest honesty and swiftness only when citizens cooperate by informing the matter the right time. However, during emergencies people forget important numbers and start pondering on their next action. A promotional magnet with emergency dial numbers of fire services, ambulance services and others would easily come to their rescue. 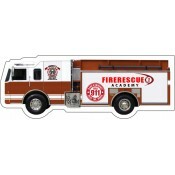 Fire services and state fire departments can easily improve their visibility by involving any of these customized emergency magnets. For enhanced benefits, they can combine it with other customizable dial 911 magnets, ambulance services magnets and more. 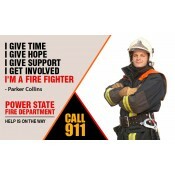 Full-color emergency services magnets make great gift items during trade shows, medical camps, health care awareness programs, community service events and more. 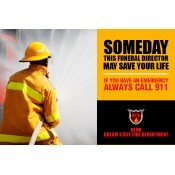 Fire departments can send these customized magnets as mailers to locals for familiarizing their services and benefits. Avail discounts on art setup, online design proof and shipping anywhere within the contiguous USA. We don’t charge anything extra for the reorder of the same promotional magnet. We offer one of the best turnaround times and emergency services can always approach us with their emergency orders! 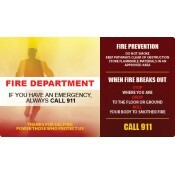 Save big on wholesale orders of these emergency magnets. To know more about printing and other details, feel free to call us at 855-762-4638 (Toll Free) or write to us at info@CMagnets.com.